Snetterton, one of my all time favourite circuits. A long technical track that, when driven right, is so rewarding. I couldn’t wait to get back out after the disappointments of Rockingham, but none the less I knew this weekend I would have to dig deeper than I have ever before as the BOP was so against us. For those wondering what BOP is well… its either a systematic way of keeping the grid full of different manufactures of race car, and used to even the cars out and provide close racing, or something for the drivers to moan about on a minute by minute basis. For us, it was the later of the two. Our car was seriously restricted, and on a power circuit like Snetterton, it really was a kick in the teeth. But still, we arrived with our heads held high and bags of confidence. Saturday, Going into FP1 we had a set run plan, however some technical issue prevented us from keeping to that, leaving running to a minimum. FP2 struck us with some more bad luck, as the steering rack failed through a high compression corner, forcing us to retire the car from the session. Next session for us was qualifying, and both Anna and I were feeling a little unsure of the pace in the car due to the limited running we had earlier in the day. But we both strapped in and recorded our PB times, however both of us knew there was more time out there, and we just needed the seat time to find it. Now our heads were focused on the races. Sunday. Race day! I woke up on Sunday with a spring in my step, as we had discussed our race plan the night before, and I was feeling rather refreshed about it all. After breakfast was a short 10 min warm up session, which we decided would be more useful for Anna to take part in, as she was to start the first race. Post session we decided to change the setup slightly to allow us to get more mechanical grip in the slower corners, and help us make the most of what we had performance wise. We then lined up for race 1, Anna in the pilot seat made a great start, but even from the pit wall, it was clear to see she had a problem, she wasn’t comfortable for some reason. No later than 10 seconds after I thought this, Anna came over the radio highlighting concern about the brake pedal. An issue involving brakes is never taken lightly and so she was forced to box so that the problem to be solved. This unfortunately lost us a lap in the race, and meant that my stint had become a glorified test session. However I never gave up and pushed every lap, to better understand the car and the setup, recording another PB lap time during the race. We finished without any more drama but were much further down the field than we hoped for. Race 2 started, and with the time arriving at T minus 45 minutes there was a problem. During a set up change a part had failed and caused a huge delay to the car. The rear left suspension was in need of a rebuild, and things started to look rather bleak, but with the hustle of our engineer we managed to sort the issue as best we could and get the car out on the grid. 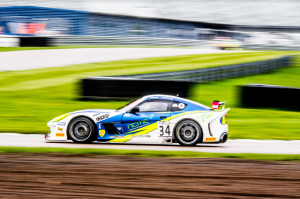 Due to the nature of the issue it meant that the ABS in the car wasn’t working to its full potential, therefore limiting our efficiency on the brakes. never the less, I strapped in for the start of the race. I made a good clean start and and settled into my groove. Battling hard with our sister car to maintain position. However my efforts were thwarted as the faster GT3 cars came through and left me off line. Which meant I had to concede the position but I kept my head down and started to post faster and faster lap times. As the sister car drove into the pits for the driver change I opted to stay out to try and stretch the gap to them. With pure focus I managed to beat my previous PB lap time again, and got us a jump on our team mates. When I handed the car to Anna we were ahead of them. Anna put in a solid performance and brought the car home in a respectable position. The end result was not what we hoped for, but because of our BOP we really just didn’t have the pace in the car to push any further. I am still proud of what we achieved as we truly delivered the best we could with what we had. On the up, this means that our BOP will improve for Silverstone GP on the 9th and 10th of June. So now its all focus on the next round. Rockingham! A track I was familiar with from my fiesta days but had never previously had the chance to drive in the Ginetta, so I was keen to get started. The weekend started on Friday, and whilst there was no testing, it meant I could use the time to have a professional seat fit. This was something that I had not really given much thought to but, now I have one, it is as if I can’t drive without it. I felt even more at home than I did before, the fitting was perfect. Despite the lack of testing I was still observing the other cars on track, to see how the circuit was evolving over the day, and to see how the monsoon-like conditions affected the performance of the cars. I love the wet and was excited to get on track the next day and start exploring the limits of both track and car. Saturday, I woke to an obscene amount of rain, even more than the day before! Heading to the track I was buzzing for the day ahead. Free Practice 1 (FP1) – After settling into a good rhythm I posted a time that would put us mid-table in the times, and was feeling confident, the car felt good, but there were definitely more improvements to be made. Free Practice 2 (FP2) – This time, we were left scratching our heads. The track had become even wetter than before, with water cascading down the banked turns. We decided to make a change to the car, but it left both Anna and I with little confidence in the rear of the car. So, we tried another change but this lead to the issue becoming worse still. With little time left in the session, we had to think of something drastic, and something drastic it was. 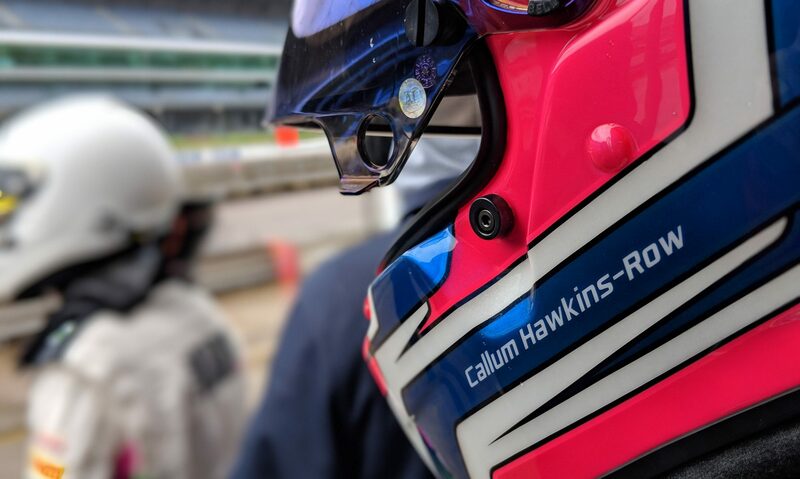 I must say I have never been nervous driving a car in the wet, in fact, it’s quite the contrary, but going through the first banked turn of Rockingham, the car suddenly snapped several times, and with the wall getting ever closer, I got that feeling for the very first time. Unfortunately the drama was to come. That very same lap, myself and 4 other cars were to fall victim to oil and coolant, dropped onto an already greasy track from another car. It led us all to pirouette almost in sync. I managed to keep the car from sustaining any severe damage, and drove back to the pits, at which point the red flag was shown, and it was evident not everyone had been as lucky as me. Our sister car, number 88 had sustained a large amount of chassis damage after colliding with the wall. After the palaver of FP2, we weren’t hoping for too much in Quali’ and, due to a lack of rear end stability and despite pushing hard, both Anna and I were just not able to match the times of the quickest on track. We had to accept that we would be starting towards the tail end of the grid. That said, we were not deterred – this meant we could only go forwards and would drive to win the places back. Race day! At this point the track had dried but was still threatening to rain. Anna took the start due to the regulations of the championship and with some “questionable” driving from some of the competitors it was a rough start indeed. Despite this she drove with passion and her pace was improving every single lap. Unfortunately, our hopes were short lived and, after just 20 minutes or so into the race, a catastrophic engine failure ended our our race. We were all devastated that the amazing progress on track we were making was cut short so early, I felt rather dissatisfied and disappointed. This does not mean that we are disheartened in any way, rather it will push us to really develop ourselves and we will come back to the track stronger and quicker than ever. 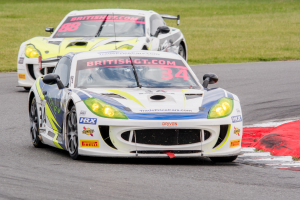 The next track is Snetterton, on 26/27 May. This is one of my all-time favourite circuits and I cant wait! Despite my own disappointment there was a positive end to the day with the team’s efforts being justly recognised as they were awarded The British GT Team of the Weekend Trophy. A very well deserved win as every person in the team really did work their socks off during a truly challenging and difficult weekend.